Absolutely shocking service at this store today.. went in at 10.45, after wanting a particular style of boot, due do having a bad hip. While trying on boots, my daughter was browsing the men’s section, as having a size 11 feet it’s difficult for her to get work shoes. She found some flat black canvas slip on shoes which had a label on saying 2 for £8. I asked the shop assistant called CHRIS, who was a young girl, and was leaning up against the store room door, how much it was for 1 pair , and he’s response was ‘Ohhhhh I’m not sure , it cd b £4.99 or £6.99.....I don’t know ,,,,promptly followed by a huge open mouthed YAWN!!!!!! Another staff member came from the store room with 2 cups of hot coffee, and she took this cup and said ‘Oh just what I need’!!!!!! she didn’t bother going to check the price of the shoes I was asking about, and then started to chat to the other staff member. Neither of them cd bothered to see if I needed assistance, when clearly I did . I took the shoes and the boots to the til, but very reluctantly, as her whole attitude just made me want to put the shoes and boots back on the shelf and walk out!!!!! But as I said I really needed the boots I had selected, as the heel is just the right size for a hip problem I have. CHRIS then managed to tear herself away from the door of the stockroom to come to the til where I had the boots and the 2 pairs of shoes, and proceeded to scan the boots , with out word, and say to me £24.99...... so I asked her very politely, even though by now I was EXTREMELY annoyed at her whole stinking attitude....’Are the shoes free today’......she looked at me as if she didn’t understand my question, as the shoes were right beside the boots she had just scanned, and I had previously less than 5 mins asked her about the shoes, .....and replied with ‘ oh I am not with it this morning’!!!!!!! I couldn’t even reply with a single comment by this stage . Clearly this young girl did not want to be in work, and I feel she was very complacent with her job attitude. 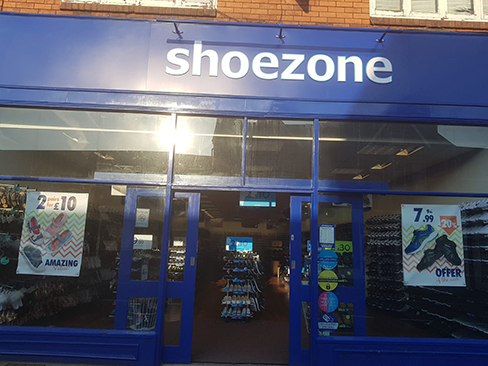 She certainly made me see that shoe zone is definitely NOT a shop I will be returning too, and will now be looking for a second pair of winter boots from other stores, as there are plenty of more helpful, welcoming stores out there with mischief more helpful and welcoming staff. I just wish I had been a ‘mystery shopper, yesterday , and been able to report back to head office , and show them exactly how a staff member treats its customers. Will never return to this branch again. Actually shocked at the rudeness and unprofessional sam of staff here.